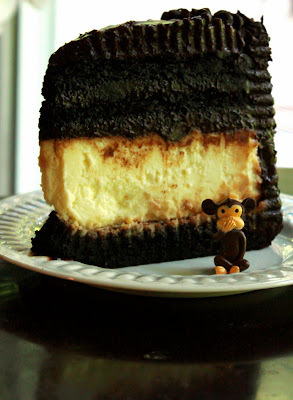 Junior's Devil's Food Cheesecake... with my monkey friend. I've said it before and I'll say it again. I'm a cheesecake nut. The day I ate a cheesecake from Junior's marked the day I saw the biggest slice of cheesecake in my life. It was HUGE. Ginormous! Gargantuan. In biblical terms, it was Goliath and I was David. I chose the Devil's Food Cake Cheesecake ($6.25) because it looked ridiculously chocolate-y. Apparently, it was also featured on the Food Network's "Throwdown with Bobby Flay." Put simply it was an uber-dense cheesecake sandwiched in layers of chocolate cake and smooth chocolate icing. It was so tall, there was absolutely no way to get from top to bottom and get all five inches of it in one bite (unless you used Goliath's fork, maybe). The verdict: I would buy this slice for the chocolate cake alone. It had a nice moist, almost fudgy consistency. The cheesecake was the real deal too--thick, intense, and bursting with cream cheese. BUT, I can't say the two blended well together. It actually felt more like a war between equally rich, super different flavors, and it was each cake for himself. The upside, however, is that in a way, you get two awesome desserts. Speaking of massive cakes, check out this 265-pound wedding cake shaped in impressive lifesize proportions of an animal. Hint: It might make you say "Holy Cow!" Don't forget free chocolate fridays (down to its final 2 weeks)! however the directions are very long and looks a little hard to make but i will try the recipe sometime this week cant wait! !